Lacquer: The Best Medicine! : Madison Street Beauty GIVEAWAY! Polishes provided for my honest review. All opinions are my own. Goooood morning, all! 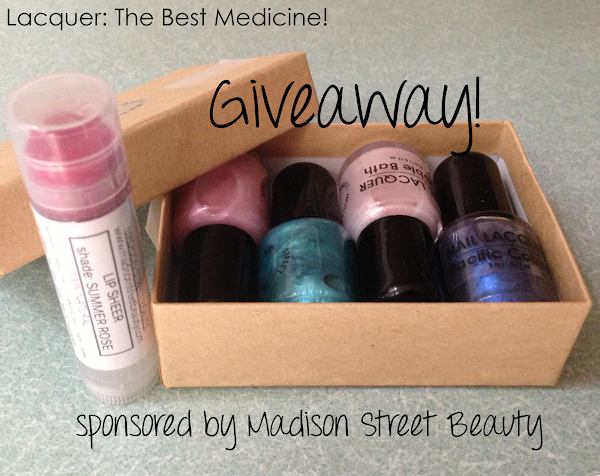 Today I have four lovely polishes to show you sent to me by Madison Street Beauty, as well as a special surprise! Okay I'll tell you the surprise first: Madison Street Beauty has sent me an extra set of polishes and a lovely sheer lip balm for me to give away to one of my readers! YAY! 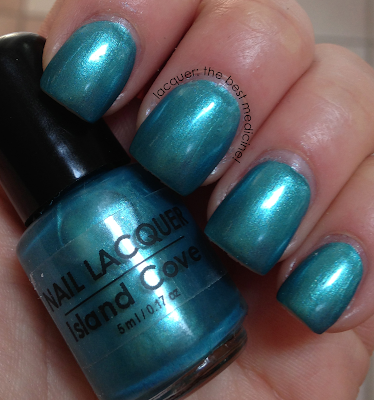 First up we have Island Cove, which is a gorgeous shimmering teal color. First I would like to just say this: I was literally ASTOUNDED at how fantastic the application for all 4 of these polishes was. I was totally expecting these to pull and be streaky (as most shimmery polishes are) but they were not at ALL! The formula for all of these was absolutely fantastic! Show below is two coats of Island Cove. 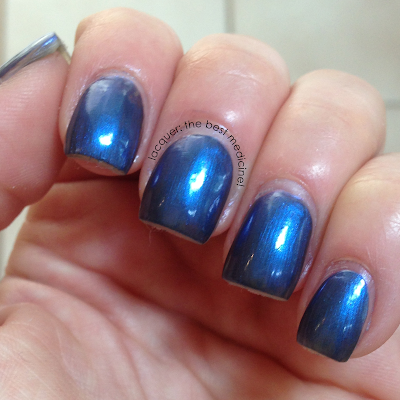 Next up we have Pacific Cobalt, an opaque, navy blue shimmer. You know how I looove my navy blues! I adore the shimmer even more - just the perfect color! Shown below is two coats of Pacific Cobalt. 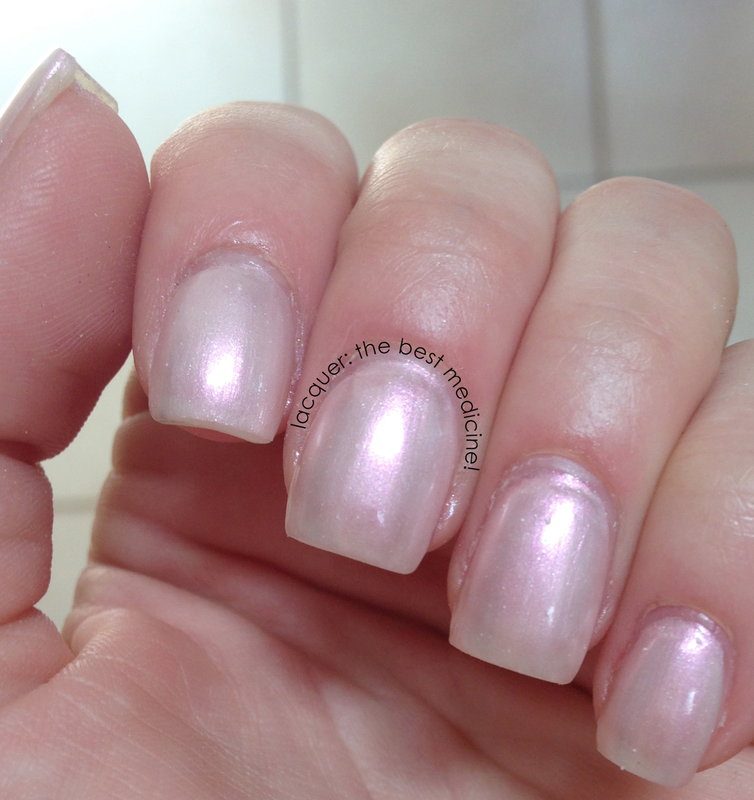 The third polish the winner will receive is called Ballet Lesson. It's an ULTRA-sheer bubblegum pink with lots of shimmer. Girly and adorable! Shown below is three coats of Ballet Lesson. 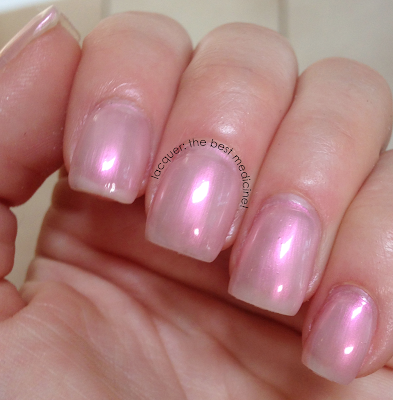 The last polish in this 4-pack up for grabs is Bubble Bath: a sheer, girly pink with a bright pink shimmer. Show below is two coats. Madison Street Beauty was kind enough to send me some lip balm to try out, called Summer Rose. I will spare you the picture of my close-up kissy face, but I HAVE to tell you how nice this lip balm is; it's is sheer and neutral, but it has a hint of color to it - it makes my lips look like they have a naturally GORGEOUS rose color to them! And they sent me an extra one to pass on to the lucky winner of the giveaway! Which one is your favorite shade? I am torn between Island Cove and Pacific Cobalt. Loving those deep blue colors! The giveaway is open to US residents only, and will end on July 16, 2013. The winner has 48 hours to respond before the prize goes to a different winner! Enter below using the rafflecopter widget. Good Luck! I love Madison Street and have been eyeballing them for a long time. I'm so happy I stumbled across this cause their puddle pics give great color but nothing shows it off like a swatch! Hi, your blog look so gorgeous and inspirational, dear! LOLOL I am a lucky girl! Ty for the giveaway. I'm loving all the colors but I really lime Island Cove. sweet blog!let’s follow each other on gfc&bloglovin?